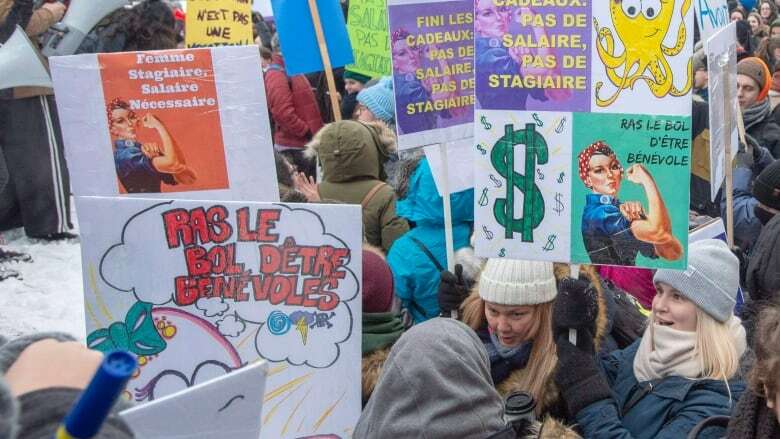 As thousands of students strike over unpaid internships in Quebec, one expert argues that the issue disproportionately affects women. "I've seen consistent trends of gender bias in terms of the intern economy," said Alexandre Frenette, an associate director at the Curb Center for Art, Enterprise and Public Policy at Vanderbilt University, Tenn.
"Certain fields ... like architecture tend to pay their interns and they tend to be mostly men, versus other fields like arts education [that] tend to be mostly women, and those are unpaid internships," he told The Current's Anna Maria Tremonti. Nearly 40,000 students and interns at universities and CEGEPs across Quebec have been on strike this week. They want the provincial government to put an end to unpaid internships, which are allowed under certain conditions, and guarantee full salaries and standardized working conditions for all student interns. Internships can be mandatory course requirements that last months, and leave students juggling their placement, studies and second jobs to make ends meet. Frenette said that even in intern positions, so-called "women's work" — such as nursing, social work or education — tends to be devalued as "something that is done out of caring, out of a labour of love." The worker is seen as getting "various kinds of non-monetary benefits from this work, and that overall informs this very gendered system." Laurie Bissonnette, who is studying social work at the University of Quebec at Montreal, who is on strike this week. Alexandre Frenette, an associate director at the Curb Center for Art, Enterprise and Public Policy at Vanderbilt University, who is working on a book called The Intern Economy. Produced by Ines Colabrese, Jennifer Yoon and Amanda Klang.